On a quest for his lost identity, Conrad Hart must combat alien conspirators and their minions on Earth and on alien worlds. On the way he encounters allies who offer advice and clues so he can complete his mission to save Earth. --From the SNES Flash Back: The Quest for Identity instruction manual. 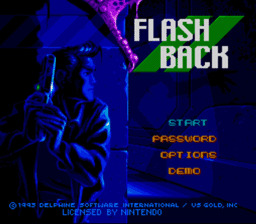 Play Flash Back: The Quest for Identity Now! You are a scientist on the run from aliens. As you are making your escape on a jet bike you are shot down. You wake up on the planet below, your memory is gone, and all you have is a holocube as a clue as to where to go. You must search for who you are and hopefully stop the impending threat. The graphics may be blocky but believe me the story makes up for it. This game plays a lot like Out of this World. You will solve puzzles both physical and mental to survive each level. Doing errands for people will sometimes reward you with new information or items to help you along the way. Gadgets such as force fields, cartridges, a shield battery, and pistol will serve as tools to solve puzzles. This game will have you wanting more even after you have beaten it. A Button Draw or conceal weapon. Start Button Open/close inventory screen.